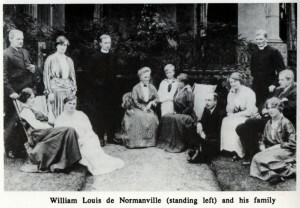 William Louis de Normanville’s family originated in Normandy. His grandfather, the Marquis de Normanville had escaped from the Revolution in 1792, leaving his family behind in the sadly mistaken belief that women and children would be safe from revolutionaries. In England he married again and eventually dropped the title. 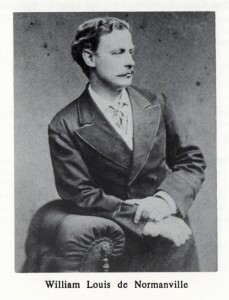 As a young man William de Normanville, having studied with his father, and evidently adventurous, spent five years in the Civil Engineers’ Department of South Australia. Back in England he worked on the Barrow Docks and Furness Railways and from 1877 until 1882 he was Engineer to the Corporation of Durham. 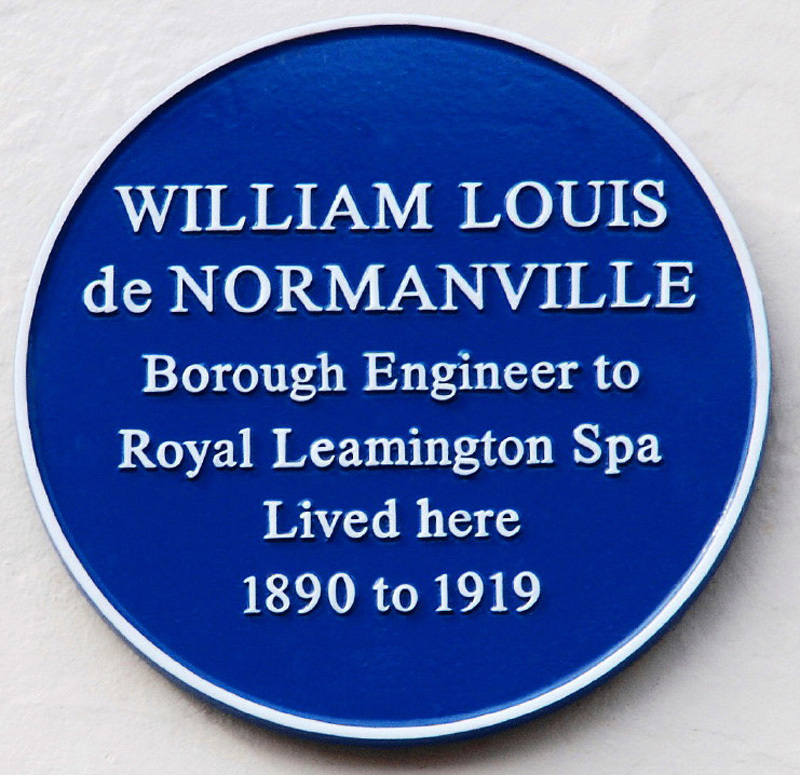 From 1882 until his retirement in 1917 he was Leamington’s Borough Engineer and Surveyor. 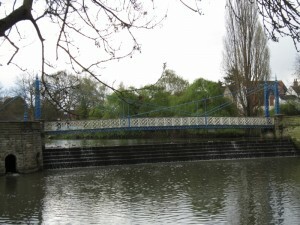 Amongst his major achievements in Leamington are the Adelaide Road Bridge (iron replacing stone); the restoration of the Pump Rooms; the renovation and layout of the Pump Room Gardens (with the addition of the bandstand); the York Bridge; the York Promenade; the swimming-baths, (now the library), with its lantern-roof on slim iron trusses; and the layout of the Mill Gardens and the Victoria Park: altogether an impressive catalogue of imaginative design and of expertise in the use of iron. 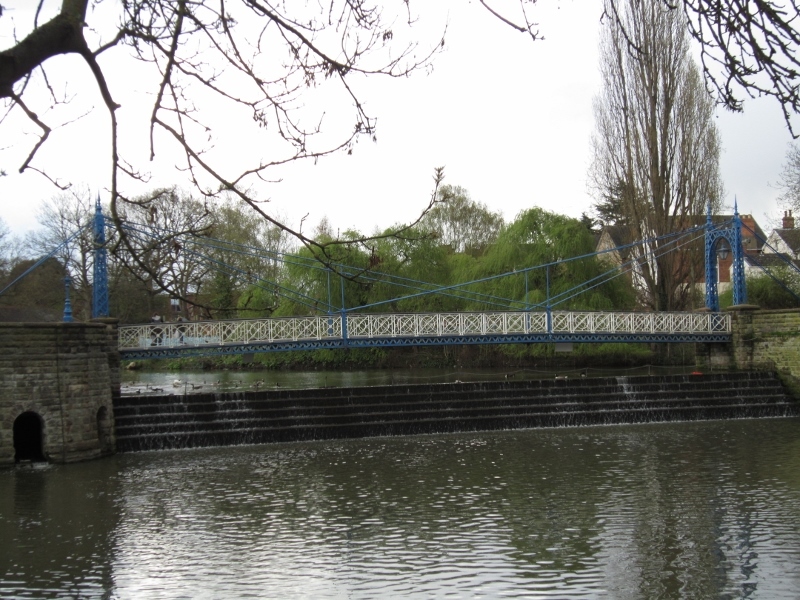 But his masterpiece, surely, is the combination of the Weir and the Mill Suspension Bridge, at once beautiful and functional. Urban on one side and rural on the other, graceful iron pillars at each end, iron trusses instead of conventional chains, and incorporating turbines in the abutments. It would be pleasant to think that one day these latter will be renovated and reinstated. Thirty-five years in a town cannot often have been better spent, but like other members of his family de Normanville was also a prolific inventor. He produced a device for measuring the speed of ships and and of a water-sprinkler that moved over the lawn powered by the force of its own water; not to mention improved versions of ladies’ belts and corsets (the Victorians were not as Victorian as we are often led to believe). A man is not judged by his professional life or his hobbies alone. As well as their own nine children he and his wife brought up his sister’s three orphaned children and another small orphaned girl who grew up to marry one of his sister’s sons. He could be strict, especially at meals (imagine the chaos otherwise); but his grandchildren remembered above all that he adored his wife. Prayers were said every evening and no doubt Sunday was a day apart. But the household was full of cheerfulness and could not possibly have avoided being noisy. There is a charming photograph of the whole family. Except for his wife in the centre and de Normanville himself on the edge, the arrangement is distinctly haphazard. Some are standing, some sitting or lounging in deck-chairs, some comfortable on the grass. Two of his sons are wearing dog-collars, two in clothes that might reasonably be called unusual. His engineering, his family, and his whole life, seem to be all of a piece, sensible, harmonious but with room for originality. He seems to have been at ease in the world, a man good for the town and good for the people around him. Artist Tim Ward of Circling the Square Ltd is about to embark on the Council’s latest public art commission for Jephson Gardens, after preliminary consultations with Janet Storrie, the author of a short biography on de Normanville, pupils of St Peter’s Primary School, members of Leamington History Group, and members of the public. 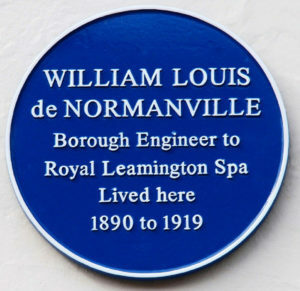 William Louis de Normanville was Leamington’s Borough Engineer and Surveyor whose major legacy to the town comprises the Adelaide Road Bridge, the York Bridge and Promenade, the Weir Suspension Bridge, the restoration of the Pump Rooms and the construction of the old swimming pool which now houses the Library, and the revamped layout of the Pump Room Gardens. He transformed the Parr and Wisden Cricket Ground into the Victoria Park that we know today, straightened the River Leam and laid out the Mill Gardens. Tim Ward has had a long and successful career in public art and landscape design. Examples of his stunning creations can be seen on his website, www.circlingthesquare.com, where he showcases his company’s delivery of high quality community projects, urban regeneration and environmental schemes. 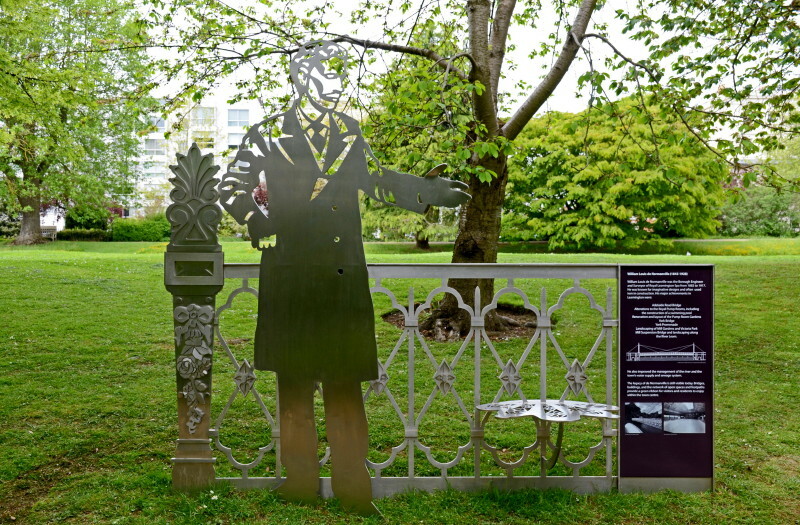 In keeping with 19th Century popularity of cut-out figures, Tim proposes an over-lifesize silhouette of de Normanville leaning on an ornamental post & balustrade section of the Adelaide Road Bridge, to be created in 10mm thick marine grade laser-cut steel. The ‘statue’ and balustrade artwork will include double-sided interpretation panels providing information about de Normanville, plus photographic imagery and technical drawings relating to his life. 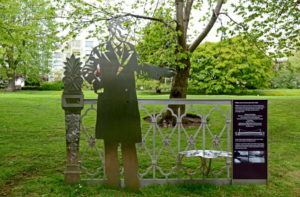 His left hand outstretched in a gesture of friendship will invite all age groups to interact with the figure, to read the information panels and participate in the artwork. Visitors can shake the giant’s hand, stand on the adjoining platform/seat to have their photographs taken or sit with the statue.